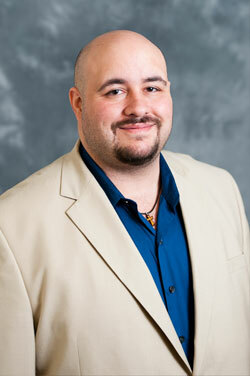 Davon W. Ferrara joined the Department of Chemistry and Physics in the Fall of 2012. His teaching duties include introductory physics classes for non-majors (PHY 1110/1120, 1140). Before coming to Belmont, he taught a Science and Society first-year writing seminar and worked as a pre-major adviser for the College of Arts and Science at Vanderbilt. He received his Bachelor of Science degree in physics and mathematics from Centenary College of Louisiana (2004), and his Master of Science (2007) and Doctor of Philosophy degrees in physics at Vanderbilt University (2011). His interests outside of the classroom include movies, science fiction, and ballroom and swing dancing. Dr. Ferrara’s research interests are varied, but center around the interactions between light and matter, especially in regard to nanoplasmonics, including active metamaterials, and nano-optics. Other areas of interest are: science education, the intersection of science, politics, and media, and the physics of ballroom dance. Students interested in any of these topics are encouraged to contact him. I would like to contact Dr. Ferrara.